The air conditioning system maintains the air in the pressurized fuselage at the correct levels of temperature, freshness and pressure. Bleed air coming from the pneumatic system (engines and APU except B787) is controlled in the flow before reaching air conditioning packs which ensure basic temperature regulation. The air is generally cooled down by heat exchanger inside the air-conditioning pack, the water is extracted and the pack outlet temperature is regulated by the cooling effect of the heat exchanger to the lowest selected temperature. Imagine the airplane is divided into different zones like the cockpit, forward and aft cabin. The demanded temperature for all zones is selected by the flight crew in the cockpit or depending on the aircraft models by the cabin crew at the forward attendant panel for the cabin sections. 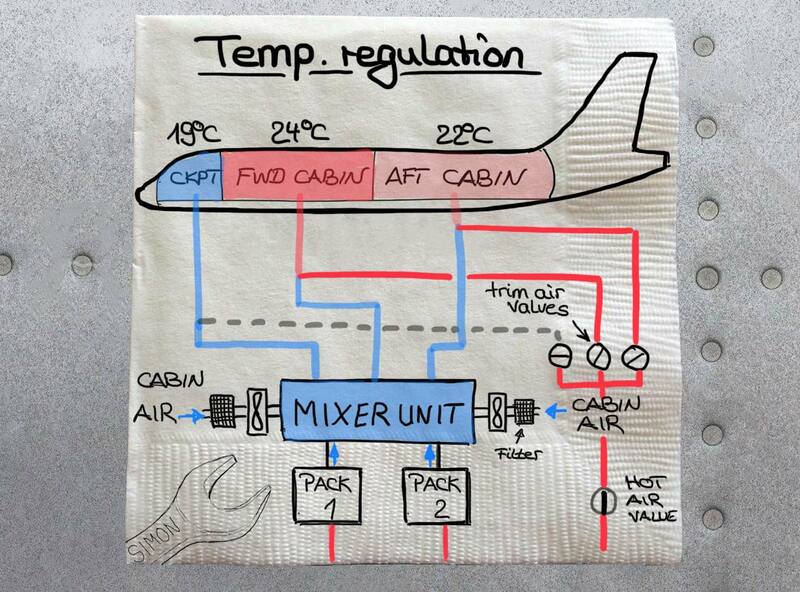 Let’s say the flight crew selects a temp of 19°C for the cockpit, a temp of 24°C for the business class in the forward cabin and the temperature in the aft cabin is selected to 22°C. The air conditioning packs regulate the discharge temp to the lowest demand temperature to achieve 19°C which flows towards the cockpit and cabin. The fresh air coming from the packs is mixed with recirculated air from the cabin in the so-called mixer unit and is distributed to all zones. Fine temperature adjustment of air distributed in the pressurized zones is obtained by controlling the amount of hot air added to the air coming from the mixer unit. The pressurization system ensures a cabin altitude safe and compatible with crew and passenger comfort. Pressurization is performed by controlling the amount of air discharged overboard to keep the air pressure inside the fuselage at a simulated cabin altitude of approximately 8000ft or 6000ft in the B787. 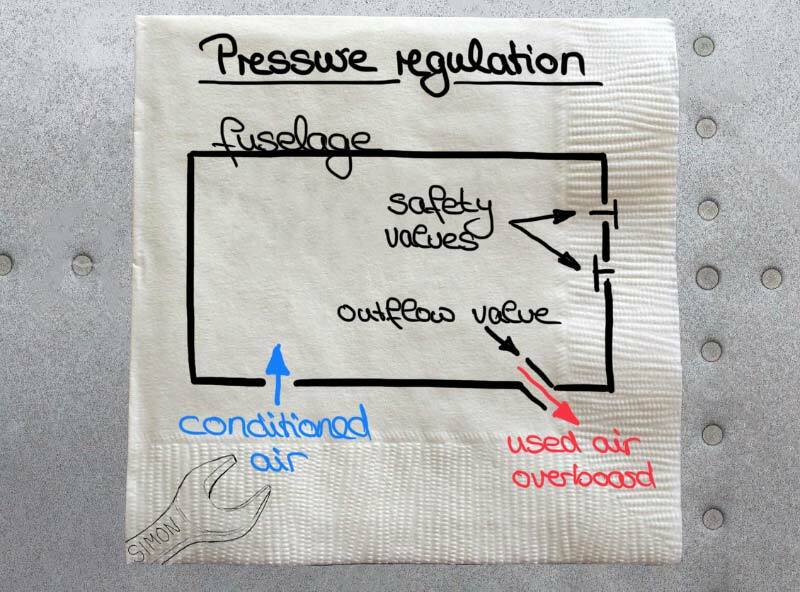 You may have noticed that a snack bag served during flight seems to be pressurized with gas. The reason therefore is that the pressure around the bag during flight is less than the pressure inside the bag so the air inside the bag expands. Why is the pressure within the fuselage not constantly equal to the pressure on ground? The airframe is designed as light as possible to safe fuel. And the differential pressure between the outside air and the pressurized aircraft is limited by material and thickness of the fuselage skin to keep the material stress within their limits. To increase the pressure in the cabin, the material of the fuselage skin has to be thicker or strengthened, but this makes the operation of the aircraft more expensive. The air flows into the cabin and leaves the fuselage via a so-called modulating outflow valve. Depending on the size the aircraft is equipped with one or two outflow valves to ensure a smooth pressure regulation. Master of the pressure regulation system are two pressure controller. Only one controller operates at a time, the other is in active stand-by means it is always ready to take over. The pressure controller uses data from the entered flight plan like the cruise flight level and aircraft configurations like engine thrust settings and air conditioning inputs to calculate a pressure profile and regulates the cabin altitude accordingly. Additionally, the controller receives actual outside air pressure data and measures the cabin pressure to calculate the differential pressure between the inside and outside pressure. I’d like to point out that the regulation happens in a closed loop. The controller always receives a feedback signal to compare the calculated data with the actual position of the valves and the actual cabin pressure. If there is a problem with the entire automatic cabin pressure regulation, the cabin altitude can be manually controlled by operating the outflow valve in manual mode. This is achieved by a switch in the cockpit to modulate the outflow valve to more open or closed, means to increase or decrease the amount of air discharged overboard. If the amount of air venting overboard equals the amount of air flowing in, then the pressure stays constant. But the pressure inside the cabin increases and therefore the simulated cabin altitude decreases, if less air is venting overboard than flowing in the cabin. Aircraft are additionally equipped with safety valves to prevent excessive positive and negative differential pressure. These safety valves are spring type valves and they open by the differential pressure against spring forces.